The Tampa Bay area is never in short supply of places to shop. Some of the best names in retail have set up shop in the neighborhood. Click below to sample a few of the locations to which Freedom Plaza provides frequent transportation. Shopping and dining have never met like this! International Plaza, adjacent to Tampa International Airport, is the most distinctive shopping and dining destination of Florida's West Coast. Four fashionable department stores, over 200 specialty shops and Bay Street at the Plaza... an open-air village of fine restaurants and small boutiques. The largest shopping mall within a 40 mile radius of Tampa, this exciting mall is anchored by JC Penney, Sears, Dillard's, and Macy's plus features over 140 specialty stores, a food court, and an AMC movie theater. With some of the most impressive brand name stores of any outlet center in the country, Prime Outlets at Ellenton is a must for shoppers seeking top quality at great prices. Plus, the Caribbean village-style architecture and tropical landscaping contribute to a great shopping experience. Freedom Plaza provides transportation to MacDill Air Force Base every month. The exchange's innovative mall concept includes a food mall, satellite pharmacy, a laundry and dry cleaners, optical shop, hearing aid service and sales shop, jewelry store, barber shop, flower shop, beauty shop and the 6th Services Squadron Attraction, Ticket and Tours office. Fountains, tropical colors and aquatic sculptures create a delightful decor in this spacious shopping center. 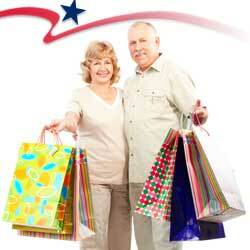 But serious shoppers come to explore more than 240 stores. Patrons armed with shopping lists whisk by the whimsical frog and frolicking manatee sculptures. Later, they enjoy the art objects after collapsing on a bench to recover from their retail reconnaissance.